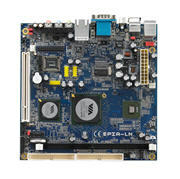 The VIA EPIA LN-Series Mini-ITX Mainboard boasts the latest generation 1.0GHz VIA C7 processor for fanless configurations with ultra low power requirements, optimized for a whole range of small form factor, low power and affordable embedded devices, and features TV-out for a rich multimedia experience. The VIA CN700 digital media IGP chipset supports up to 1GB of high bandwidth DDR2 533 memory, and has integrated VIA UniChrome Pro 2D/3D graphics with MPEG-2 decoding for smooth digital video playback. Its companion South Bridge, the VIA VT8237R Plus supports a broad array of advanced connectivity and multimedia features, and brings the latest serial and storage technologies to a wide audience. Offering a cost effective upgrade path from previous generations of VIA EPIA Mini-ITX mainboards, the VIA EPIA LN is fully compatible with all Mini-ITX, FlexATX and MicroATX chassis and associated accessories such as the new VIA 120W DC-DC converter and external PCI riser card, and supports Microsoft Windows XP/2000, XPe and CE, as well as Linux, making it the ideal platform for developers to create a wide spectrum of applications.